Leading prizewinners at the Scottish senior open amateur championship Left to right players, RW Smith (second from left), Bob Stewart, Ronnie Clark and Stephen East. 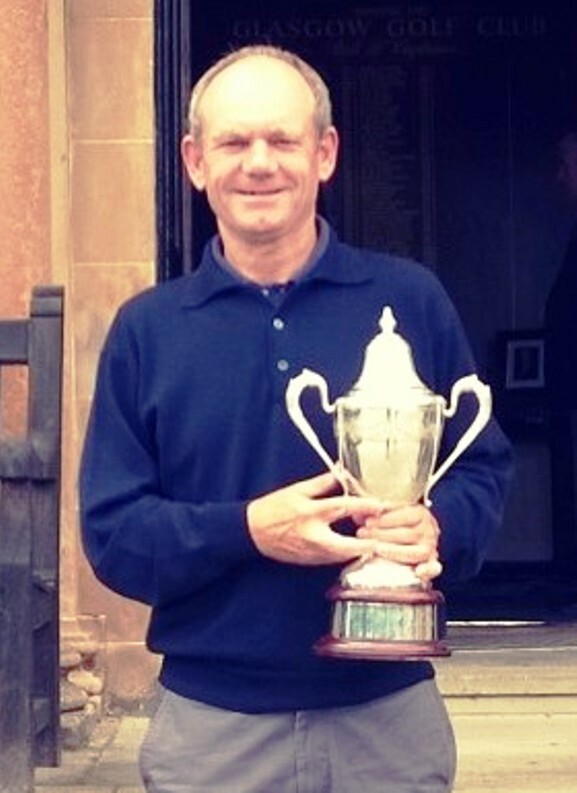 Yorkshireman Stephen East, a member at Moortown Golf Club, Leeds, added the Scottish seniors open amateur championship at Glasgow Golf Club's Killermont course today to his formidable list of tournament triumphs over the past decade or two. East, pictured below with the championship trophy, came from behind over the last round with a tournament-best, three-under-par 67 for a final total of three-under 207. His earlier rounds were 68 and 72 over a par-70 course. East had two strokes to spare at the finish from runner-up Ronnie Clark (Erskine) who scored 70-68-71 for 209. Nairn's Robert Smith played very steadily over the three rounds - 70, 71 and70 - to fill third place with an aggregate of 211. Robert Stewart (Tulliallan), who finished tied fourth overall on 212 alongside David Shields (Glenearn), earned the award for the highest finish by a player in the 65 years and over category. Second in this category was the man who formed the Scottish Senior Golf Society, Glenbervie's Gordon MacDonald, on 215 with Lindsay Gordon (Turnhouse) third in the 65years+ section with a 217 total. East won a cluster of mid-amateur titles, including the European, British and English championships, before he was eligible to play in the senior ranks when he reached 55. He had a memorable first season which ended with him winning the English senior order of merit in 2014, Stephen has kept on winning over the last two years. It looked long odds against East winning at Killermont when he bogeyed the second, third and eighth after birdieing the first. But he was five under par for his last 10 holes, birdieing the ninth, short 11th, 13th, 15th and 17th, coming home in a brilliant 31 shots. East had a bag of 12 birdies over the three rounds. Clark, joint leader at the start of the day, was still ahead of East after reaching the turn in 35 to the Englishman's 36 and the Erskine man did birdie the first, eighth, 12th and 17th but bogeys at the 10th, 15th and 18th by Clark saw him overtaken by East's home run. 214 M H Jones (Boyce Hill) 74 68 72, S Burke (Remedy Oak) 72 73 69, N Evans (St Mellons) 72 69 73, N Chesters (Hawkstone Park) 71 69 74, G Bell (Downfield) 71 69 74, L Blair (Grangemouth) 70 73 71, J Lawrence (Moor Allerton) 69 74 71. 216 R Craw (Glenbervie) 74 74 68, I Brotherston (Dumfries and Co) 72 72 7. 217 L Gordon (Turnhouse) 74 69 74, S Finnie (Royal Aberdeen) 73 69 75, R Jordan (Hacienda) 71 72 74, A Belford (Prestwick St Nicholas) 71 72 74, A Stracey (Denham) 71 71 75. 218 J Fraser (Royal Burgess) 74 74 70, L Bruckner (Hindhead) 74 74 70, W K Anderson (Cardross) 74 73 71, D Nelson (Northenden) 74 70 74, D Logie (Craigie Hill) 73 74 71, I Angus (Duff House Royal) 72 74 72, D Alexander (London Hunt) 71 75 72. 219 D Hamilton (Mortonhall) 72 75 72, L Chancellor (Inverness) 72 74 73, J Wright (Wildernesse) 70 76 73. 222 A K Helm (Merchants of Edinburgh 73 72 77, TMcLevy (Blairgowrie) 70 77 75. 223 P Simpson (Alnmouth) 77 71 75, R Barnes (East Kilbride) 75 73 75, A Brewer (Denham) 73 72 78, I Attoe (Worplesdon) 72 74 77, K Yuille (Luffness New) 71 77 75. 224 D Wilson (Blairgowrie) 74 74 76, G Wilson (Calcot Park) 72 76 76. 229 B Harris (Denver) 76 71 82, B J Bingham (Royal Troon) 71 77 81. 234 B Brooks (Meldrum House) 74 74 86.